Born: Sally Josephs in Scranton, Pennsylvania, 23 February 1905. Education: Studied painting in Paris. Family: Married Sergiu Victor, 1927; children: Richard. Career: Saleswoman, then millinery buyer, Macy's, New York, 1923-25; assistant millinery buyer, 1925, and head buyer, 1926, Bamberger's, New Jersey; designer, Serge millinery, New York, 1927-34; opened own made-to-order millinery establishment, 1934; Sally V ready-to-wear line introduced, from 1951; firm closed, 1968. Exhibitions: The Brooklyn Museum, 1942. Awards: Fashion Critics Millinery award, 1943; Coty American Fashion Critics award, 1944, 1956. Died: 14 May 1977, in New York. Design by Sally Victor, 1966. "Sally Victor," in Colliers (New York), 11 March 1939. "Sally Victor," in Current Biography, April 1954. Sheppard, Eugenia, "Sally Victor," in the New York Herald Tribune, 25 March 1964. ——, "Sally Victor," [obituary], in the New York Times, 16 May 1977. Just as the American sportswear designers were establishing the look of mix-and-match separates during the 1930s and 1940s, American milliners, especially Sally Victor, established the look in their own craft. Learning millinery first from the point of view of the buyer and customer, while working at Macy's in New York, Victor focused on "designing pretty hats that make women look prettier." Victor aspirations were simple and pure; she believed women loved pretty things and liked to be noticed wearing them. 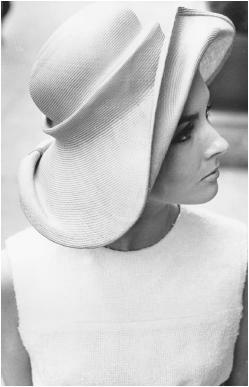 Although she was occasionally denigrated for her pursuits, like when Eugenia Sheppard of the New York Herald Tribune (25 March 1964) said Victor was "sometimes accused of designing too pretty, too feminine, too becoming, too matronly hats," Victor was credited for reviving the Ecuadorean economy by making the Panama straw hat popular again, even with the young women of the mid-1960s. Victor customers read like a who's who of the world's famous, including Mamie Eisenhower, Eleanor Roosevelt, Queen Elizabeth II, Judy Garland, and Helen Hayes. In addition to her designs being attractive, they were sophisticated, had clean lines, were considered especially "American." Victor was even called "a magnificent sculptress of straws and felts," by the New Yorker magazine in 1954. Influences on her work were many and varied, and among those Victor readily acknowledged were art exhibitions and architecture. The 1948 exhibition of art from the museums of Berlin at New York's Metropolitan Museum of Art inspired her to create hats in a Franco-Flemish mode, with coifs and beret-like shapes taken from the paintings. In 1952 she did a series, in commemoration of Marco Polo's birth, on oriental themes using shapes inspired by fans, lanterns, and pinwheels. In the late 1950s and early 1960s she looked for inspiration to such buildings as Frank Lloyd Wright's Guggenheim Museum, which she interpreted in straw. From early in her career she was counted with Lilly Daché and John Fredericks among the most important American milliners. Sally Victor hats were used to accessorize the catwalk models of American designers from Hattie Carnegie to Anne Klein. She was not only prolific in the variety of her made-to-order hats for each season, but was also among the first to establish a ready-to-wear line, Sally V. Her retirement in 1968 coincided with the demise of the hat as an essential fashion accessory and the increasing casualness of the American lifestyle. She died in New York in 1977.